Online, Real-time Test of AI Stock Picking? The following scatter plot relates daily AIEQ returns to daily SPY returns over the available sample period. 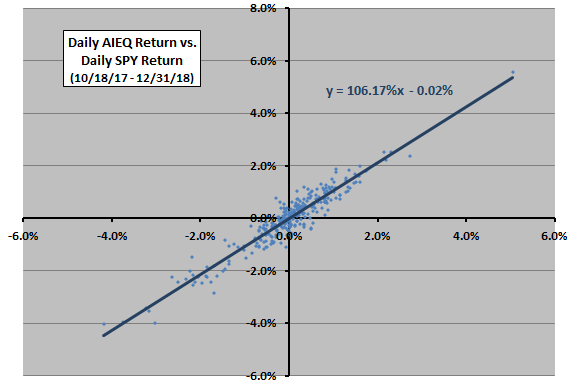 The daily alpha (beta) of AIEQ relative to SPY is -0.02% (1.06), suggesting slight underperformance with a little higher than targeted volatility. For comparison, average daily return for AIEQ (SPY) over the sample period is -0.01% (0.01%), with standard deviation 1.11% (0.99%). Results from very negative daily returns suggest that AIEQ does not offer equity market crash protection. Is there any trend in relative performance? The following chart tracks the time series of daily AIEQ return minus SPY return over the available sample period, including a linear trend line. 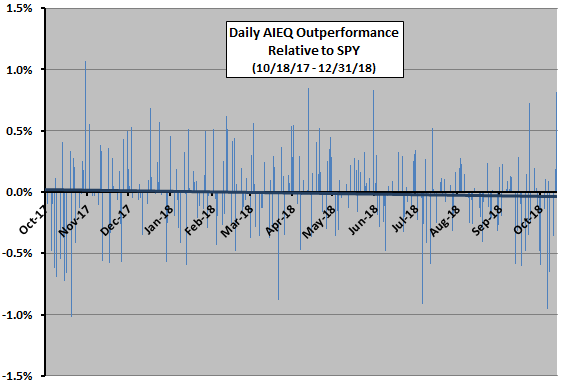 AIEQ beats SPY on 49% of trading days. Results suggest that AIEQ relative performance may be slightly weakening, but the sample is small for trend analysis. In summary, very limited available evidence offers little support for belief that an AI-based equity fund can beat the market. The sample period is extremely short, especially with respect to 12-month AIEQ valuation horizon and variety of market conditions. The underlying EquBot model may not be effective in finding stocks that outperform over short horizons. Position constraints may inhibit AI outperformance. While SPY is a reasonable benchmark based on fund offeror objectives, it may not be the best match for the specified AIEQ investing approach because of SPY’s large firm composition. We will occasionally update this analysis as performance data accumulate to assess evolving AI expertise. See also “Watsonizing Financial Markets?”.